Continuous improvement and technology is how we maintain our competitive edge. At Cannon, every person on staff is ready and willing to work with you to turn your precision specifications into precision parts. Cannon uses a combination of engineering and collaboration, new equipment, technology solutions and applications expertise to deliver value to its customers. We constantly upgrade our equipment, bringing our customers the most up-to-date and refined technological advancements for the creation of precision parts. We emphasize continuous improvement throughout our organization, encouraging our people to grow as experts and providing the training, guidance and resources they need to succeed. We provide product to Fortune 500 companies with global perspective, and we constantly look for customers who challenge us to do better, work smarter, and help them to become more competitive on a global scale. We are committed to the cultivation of a diverse workforce, maintaining our certification as a Small Disadvantaged Business by the US Small Business Administration. We put our customers’ satisfaction above all other priorities. Cannon’s manufacturing operation takes full advantage of the advances in computerized technology. We have CAD/CAM (Computer Aided Design/Computer Aided Manufacturing) capability. Using this equipment, our engineers are able to produce detailed drawings using the fastest most efficient methods possible. This ensures your products will be produced and delivered in a short time at a minimal cost to you. The AMADA CNC Coma, a 44 station turret press with two auto index stations, is used for punching the most intricate parts. The long bodied, fully guided tooling ensures highly accurate and reliable punching on various types of material and thickness. 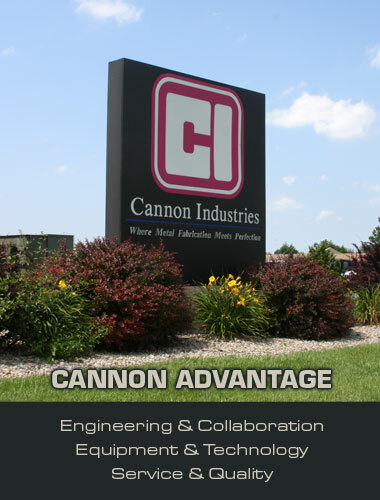 Cannon’s sheet metal finishing includes MIG/TIG and spot welding for stainless steel, cold rolled steel, and aluminum. In-house automated powder coating, painting, silk screening, irradiating and phosphating services are also offered.